Power Up with E3 Endurance! Dates Below. 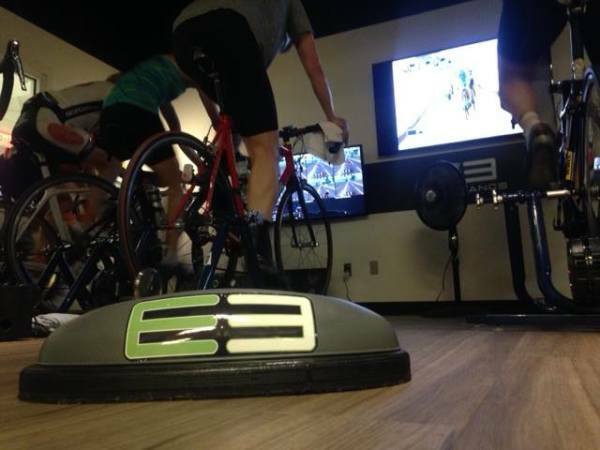 E3 Endurance operates an 8-Bike CompuTrainer Multi-Rider Studio within its performance center. The studio goal is to improve cycling efficiency and output by training with power. In E3’s studio, cyclists of all abilities will have their Functional Threshold Power (FTP) tested prior to training in this fun and dynamic group setting. We have seen improvements in power from anywhere between 5-25% improvement. Training with Power is a simple way to improve many elements of riding. Understanding the benefits of gear ratios, cadence and output will allow riders to put out great power in a more effective and efficient way. E3 Endurance power classes are for every level of cyclist and non cyclist. We have category racers, beginner cyclists, world class and novice triathletes, juniors and even runners who ride for the fitness gains of these workouts. In addition to the power based training, E3 uses the computrainers to help individuals and teams do course specific training/racing. CompuTrainer has virtual training where cyclists can ride real courses/races while drafting on the wheel of the cyclist seated next to them. It's Simple, But It's Not Easy! Classes fill up fast, and there are only 8 spots per class. Each session includes FTP Pre and Post Test with Pre and Post Body Composition Analysis. Improve your Watts and your Watts/Kilogram with these E3 Endurance Power Classes.